CMON Limited is happy to announce it is the US publisher of the award winning Kaleidos from Kaleidos Games. Designed by the prolific Spartaco Albertarelli, Kaleidos is a hidden objects game where 2 to 12 players explore a series of beautifully illustrated images by Elena Prette. At the beginning of a round, a letter card is drawn to guide players in their exploration of the image. As players discover the intricacies of each picture on their easel over the course of a minute, they will write down items correlating to the current letter card in play. Once time is up, players compare their lists, gaining 1 point for a word others also found and 3 points for each unique discovery. A new letter is drawn after points are tallied, and play continues for 10 total rounds. 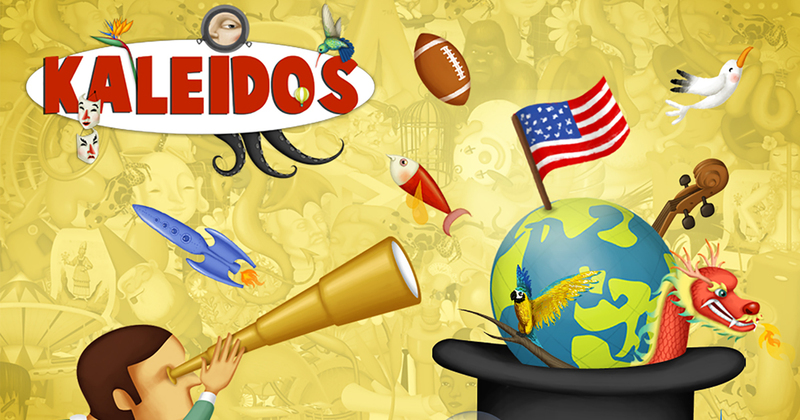 Kaleidos is a melding of art and gameplay perfect for families with children of any age or a casual game night. Spartaco Albertarelli says, "I've been waiting for this exciting moment for many years, and now I'm very proud to know that Kaleidos, my best selling game, is finally distributed in the US by such a great company like CMON Limited. CMON is big news in the game market today and everyone is talking about this fast growing company. Being part of the hype is a playful pleasure." Kaleidos will be available at retail stores in Q3 of 2016 for MSRP $39.99. CMON Limited is an international publisher of board games, tabletop games and apps. Beginning from small hobbyist roots, CMON has grown into a multinational group that publishes several award winning games, including Zombicide, Arcadia Quest, Blood Rage and more.